A little boy loses his mother at the age of four. His father is a chronic asthma patient, and an honest citizen, scarcely able to provide food and quality education to his only child. The father is bridled with a twisty land dispute with his own brother and is buried beneath a huge loan. The only hope is that the little boy would become an engineer and earn lots of money. But, as destiny would have it, the boy fails to achieve a rank and loses his father as well and is now on the hit list of local goons. Yes, the story does seem quite similar to a 70s Hindi Movie, featuring the angry young man, but, actually, I am talking about Chetan’s latest release ‘Revolution 2020’, that I finished reading yesterday. In the recent past, I was quite impressed by Chetan’s ability to churn out interesting stories from humble everyday life and had become almost his fan after reading ‘Five Point Someone’ and ‘2 States’. Naturally, riding high on his confidence, I bought his latest release at Pre-Order stage itself on Flipkart and was delivered the book on friday. Damn excited to hold a crisp new novel in my hands, I eagerly settled down to pore through 296 pages of love, corruption and ambition. As the title itself hinted at a possible love story intermingled with the greed of bribery laced community and personal vendetta, I was quite sure that it would be a satire on the corrupt ways of society and frivolity of man and expected it to be an interesting read. The Prologue reconfirmed my initial hunches. Though, it was quite similar to the prologue of ‘Three Mistakes’, where a person shares his life story with Chetan Bhagat and the versatile author makes a novel out of it. But, in this book, Chetan seems to have undergone a slight transformation. He is now projected as a New age Motivational Guru, speaking for the benefit of students of GangaTech College, and he ends up acting as a sound board for the 26 year old Director, Gopal Mishra, who is one of the youngest, richest and yet the unhappiest man in the holy city of Varanasi. I must say, the Prologue was interesting and even better was the beginning of the story, with a ten year old Gopal, stealing tiffin from his classmate Aarti’s school bag. One thing leads to another and soon Gopal and Aarti become best friends, sharing their food and time. Just when I expected the story to follow a romantic lead, Chetan introduced a twist by meddling love with career. Gopal is the only ray of hope in his sick father’s life, and is forced to go to Kota, so that he can get a seat in an engineering college and earn lots of money, take care of his family court case and arrange funds for the operation of his asthmatic father. As expected, the frail shoulders of this love-lost young man snap under the heavy load, and he returns to Varanasi as a doomed man, only to find Aarti in the arms of his childhood friend, Raghav. Gopal’s father is not able to deal with his son’s failure and dies, leaving him with a heavy loan and no money. Now, what would the boy do? Kill himself or beg his uncle for an out of court settlement or become a thief to get rid of the loan? Well, any normal man under ordinary circumstances would have taken one of the above course. BUT, when you are reading Chetan Bhagat, you must not expect anything logical and always be ready for the most bizarre conclusion to follow. And, true to his style, Bhagat shocked me again, by making this poor orphan the director of an Engineering College, who is offered a political opportunity and is the darling of a bright, beautiful young girl. Would these new changes make Gopal happy or would he further slip in his life, forms the basic framework of this novel, that oscillates between love, friendship, jealousy, moral responsibilities and the wide spread corruption and degradation in the society. During the initial few pages itself, I had realized that Revolution 2020 is somewhat different from Chetan’s earlier novels. It had a sombre attitude, riding more on sympathy wave than the devil-may-care tone of Five Point or Two States. There were even lesser swear words and the language and narration was also more lucid and serious. And, I seriously believed that this book would herald a new REVOLUTION in the creative field of Indian Motivational writing. But, soon I found the sobriety replaced by an over all melancholy and the novel appeared to be more a sermon on the immoral society, than an interesting love triangle. Chetan’s trademark sense of humour and witty one liners were absent and emphasis was simply given on bringing about the defects of our civilization. The rampant corruption and moral lassitude occupied center stage, and Gopal and Raghav became the epitome of evil and good, confusing their personal tiff with the high profile cleansing of Ganga and mushrooming of technical institutes run by goons and politicians. Though, Revolution 2020’s story did have a potential of achieving a higher state and be a stinging satire, but, in his zeal to please both the intellectuals and masses, I think, the author sacrificed the seriousness of topic, rapidly switching the storyline between romance and revolution. And, in the end, the story did justice to none of the agendas. Even the characters and the situations seemed almost impossible and artificial. Aarti, who should have been the catalyst in bringing about a change in the moral character of Gopal, was instead presented as a confused girl, who changes sides with wealth. Her intimacy with Gopal and Raghav increased or decreased with their respective money making abilities. Moreover, the concept of Revolution 2020, with young man changing the face of society, though, inspiring appeared forced and did not go with the storyline. I found Raghav too rigid and Gopal too timid, and Aarti the quintessential party hopper. The absence of strong characters, witty punches and a well defined story spelled doom for this high potential novel. 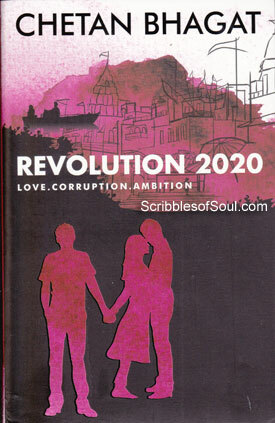 And, though, I liked Revolution 2020 in parts, the end result was neither inspiring nor entertaining. It is a so so novel, that you may read once and forget. Not at all in the league of Two States or Five Point Someone! I guess all the characters — Gopal, Aarti and Raghav are well executed! Kudos to Mr. Bhagat as its a treat to his readers.